Posted on February 5, 2019 by Miss Thompson. Posted on November 20, 2018 by Miss Thompson. Posted on October 15, 2018 by Miss Thompson. This year Friends of Prep are hoping to reinstate the popular fundraising Prep School Calendar and are seeking sponsorship from local businesses to help reduce costs. If you have a business/ know a business who can help, they would really appreciate your help. For a donation of £100, your business would be advertised on one of the monthly pages. The first twelve companies to reply will be promoted through this method. This year’s Friends of Prep fundraising goals are to purchase an online subscription to a literacy programme (BUG CLUB) and enhance the outdoor activity space outside Pre-School. If you have a business that you would like to promote and in turn support your child’s school , please contact Catherine Shaw at vcbfriendsofprep@gmail.com. Posted on October 3, 2018 by Miss Thompson. Posted on May 9, 2018 by Miss Thompson. That’s 47 businesses with 51 great offers we now have on the Scheme so there’s bound to be something for everyone. Please click here an updated list of offers, for your information. If you still wish to buy a BT9 card, you can do so at any time by purchasing directly from Kelly at Victoria Prep reception, from the Zip Yard (581 Lisburn Rd), from Peak Physique (721A Lisburn Rd) OR by going on-line to the BT9 Incentives website at www.bt9incentives.co.uk. Posted on March 14, 2018 by Miss Thompson. Posted on January 29, 2018 by Miss Thompson. Click here for information from the BT9 Incentives Team regarding this year’s BT9 Incentives Scheme. Posted on January 12, 2018 by Miss Thompson. Click here for information on upcoming events. Posted on January 10, 2018 by Miss Thompson. We are excited to announce a special event which will be happening on Wednesday 6th December between 6-8.30 pm; our first Christmas Craft Fair! Please come along and enjoy a wide array of over a dozen hand picked artisan gift stalls including handcrafted Christmas Wreaths, Wooden Crafts and Luxury Cosmetics. Live Christmas carols and coffee & mince pies will be provided and the kids will not be forgotten either; Santa will be there in his grotto waiting to say hello and we have special arts & crafts making and festive colouring section. There will also be confectionary stalls including popcorn and even a chocolate fountain. Come along with your family and friends and enjoy our festive and fun filled evening experience. Everyone is welcome! 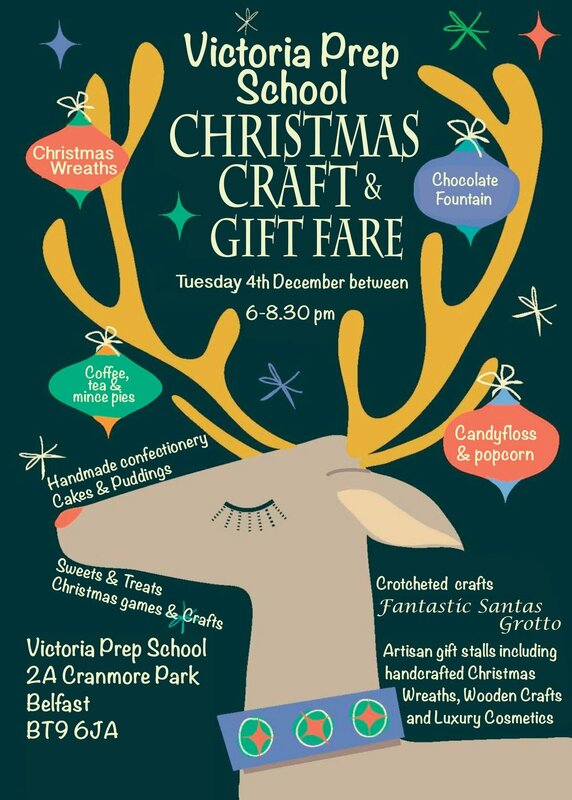 We promise you a wonderful evening where you can support the school while selecting unique Christmas gifts and soaking up the festive season. Posted on November 27, 2017 by Miss Thompson. 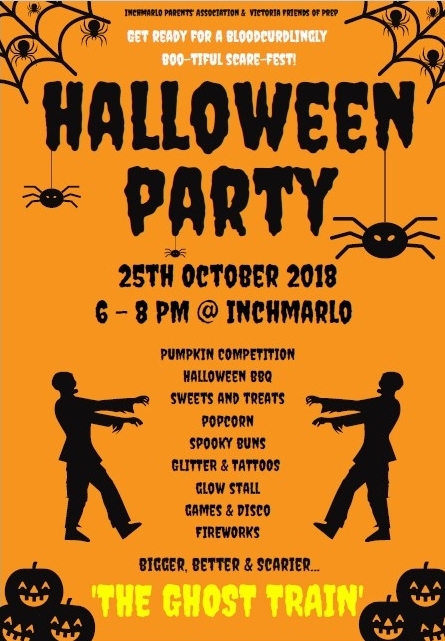 The Inchmarlo Parents Association and VCB Friends of Prep have collaborated again this year, to bring you what we hope will be a fabulous, freaky, fun filled Halloween Party on Thursday 26 October from 6-8pm. Fancy dress is definitely to be encouraged amongst the boys and girls. The IPA committee and FOP will be in fancy dress and it would be great to see parents embrace the Halloween madness and come along in fancy dress too! Spot prizes will be awarded for the best fancy dress costumes! The annual Pumpkin Competition will take place again this year. Carved pumpkins should be brought to Inchmarlo on the morning of Thursday 26th October and left on the tables inside, in the main corridor, opposite after schools. Based on previous entries, Mr Smyth and Mrs Hrabovsky will have a hard job choosing the winners! Pumpkin prizes will be awarded in the gym at 7.15pm. New for this year will be spooky Halloween punch, suitable for kids and adults! We’re so excited about our new additions this year. The ‘Tent of Terror’ will be at the back of the gym - ‘enter if you dare’! And our new spooktacular ‘Ghost Train’ will be weaving its way around the Forest School and pitches for those brave enough to take the trip! Back this year is the Spooky Fun Zone behind the gym, with a ghouly coconut shy, hoop a pumpkin, and more. A Ghostly Disco can be found in the gym. Please make sure that some pocket money has been saved for glow sticks, snappers, torches and our other spooky stalls in the covered way - our knitted winter hat stall will also be back again this year. Tea, coffee and spooky Halloween punch will be available near the Spooky Fun Zone, or in the canteen if it rains. A delicious selection of spooky buns, beastly biscuits, creepy cupcakes and scary sweet treats will be available in the covered way. Enjoy on the night or buy a spooky selection to take away and enjoy at home! Don't miss the Fireworks Display at 7.40pm. Spectators will have a good view from the tarmac behind the gym. Please be mindful of our neighbours when parking your cars. We received complaints about the parking at last year’s event and we would ask that you take care not to block entrances or footpaths, whether on Cranmore Gardens, Bawnmore Road, or elsewhere. Toilets will be available in the P1 building. Please ensure that children stay off the grass areas where the fireworks are being let off from 7.30 onwards. Please ensure that children do not run through the Forest Schools area and lower pitches where the ghost train will be travelling. We will have perimeter security courtesy of an RBAI team and Dads, but please remind your children not to leave the grounds if you get separated, and perhaps suggest the friendship bench beside the covered way as a good meeting point. For those of you who are donating buns and biscuits for the event, please be reminded that Inchmarlo and VCB are nut free schools. If you would like to get involved in the preparations for the event please get in touch with any IPA/FoP member. Volunteers to help with decorating the school, manning stalls, clearing up or providing perimeter security are always welcome. We very much look forward to welcoming all Inchmarlo and VCB Prep families to the event. Posted on October 26, 2017 by Miss Thompson. Thank you to our fantastic Friends of Prep and helpers for organising an amazing Welcome Fair and BBQ on Saturday 23rd September. The day was a wonderful success and everyone had lots of fun. Thankfully the weather was gracious so we could enjoy the many outdoor activities and, despite rumours that it was the raffle prize, Mrs Hrabovsky managed to hold on to her car! Posted on October 5, 2017 by Miss Thompson. Thank you to Friends of Prep and volunteers for organising the Valentine’s Event on Friday 10th February. The morning was a great success and a lot of fun for pupils and family members with activities from face-painting to biscuit decorating. A fabulous profit of £674.91 was raised and lots of pink and red ensured we all embraced the theme. Thank you for your support. Posted on February 28, 2017 by Miss Thompson. We are pleased to announce the launch of the BT9 Incentives Scheme for 2017, following its great success last year when we raised almost £4,000 for Inchmarlo and Victoria Prep through the sale of just under 200 annual membership cards at a unit price of £20. This year the card is being replaced by a new BT9 Incentives key fob card (a smaller card to fit onto your keyring) which we hope you will find even more convenient to carry around so that you don’t miss out on the fantastic discounts and offers available from our wide selection of participating businesses which range from coffee shops, clothes shops, restaurants and exercise studios to hairdressers, drycleaners, butchers and opticians, most of which are within walking distance of the two schools. We are thrilled that the majority of retailers from last year have decided to remain within the Scheme for 2017 and are delighted to welcome on board a number of new member businesses, including Café Mauds, Belfast Woodfired Pizza Company, The Chelsea Wine Bar, Playball, Clip ‘n Climb, Peak Physique and Medical Aesthetics NI. A complete list of all participating businesses, and their respective offers, is available here, for your information, and will be available on the school websites and our facebook page at https://www.facebook.com/groups/Bt9incentives. For convenience, we also intend to display a hard copy of the offers list within the premises of both schools, namely on the front door to Reception at Victoria Prep and in the covered walkway at Inchmarlo. The new key fob card (hereafter referred to as card) will be valid for the whole of the 2017 calendar year and the price will remain at £20 which represents fantastic value as those of you who bought the card last year can testify. The breadth and quality of the discounts available will pay for the card multiple times over so what easier way to support both our schools and the local business community! To purchase your card(s), please complete the application form and send into school via your daughter’s schoolbag. We will aim to process the applications quickly so as to provide you with your new card(s) the next day or the day after that, at the latest. This year, for the first time, the card will also be available for sale at a few of our selected retail outlets, these being Gotto Sports (Stranmillis), The Zip Yard (Lisburn Road) and Peak Physique (Lisburn Road). We hope that you tell your friends, family and wider network of contacts about the wonderful discounts on offer so that they are encouraged to buy a card as well, either through you, the parents, or at one of the three external outlets mentioned above. We would like to thank you for your support in 2016 and sincerely hope that you continue to support the school this year by purchasing the new key fob cards for 2017. Enjoy your savings! Posted on January 25, 2017 by Miss Thompson. Thank you to the Inchmarlo PTA and our Friends of Prep for helping to organise the fabulous Halloween event at Inchmarlo on Thursday 27th October. The evening had a lovely atmosphere with lots of fun and was enjoyed by many pupils and parents. Posted on November 15, 2016 by Miss Thompson. Thank you to everyone who attended Deane’s at Queen’s on Friday 7th October. It was a wonderful night, and we raised a total of £1,415 for Prep. Posted on September 8, 2016 by Miss Thompson. 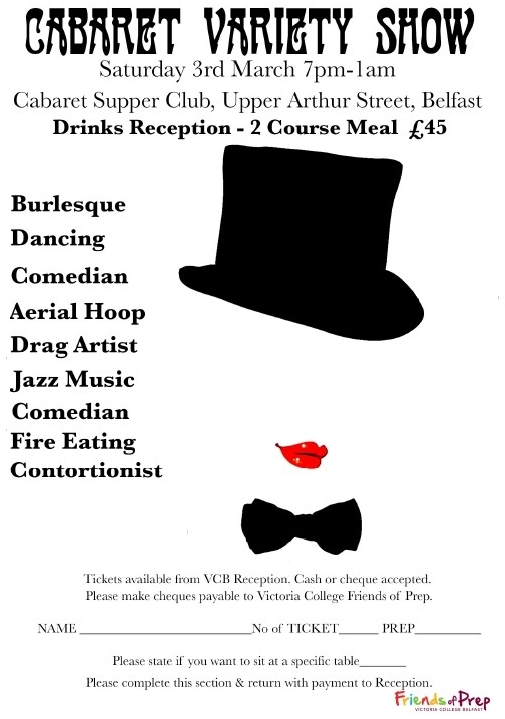 Thank you to Friends of Prep for all of their hard work and dedication in organising the Gala Ball on Saturday 5th March. It was a lovely evening with an enjoyable and relaxed atmosphere and a great success in fundraising for Prep. Posted on May 3, 2016 by Miss Thompson. Inchmarlo Parents' Association and Victoria College Friends of Prep are currently launching the new and exciting BT9 Incentives Card which offers great savings across a wide range of local businesses. The new annual membership card is now on sale at an introductory price of £20. To date the BT9 Incentives scheme has secured a wide range of businesses, including Athlos Triathlon, Barnams, Bennetton, Cranmore Dental, Framar Health, Herbert Gould, Jo Jo Maman Bebe, Little Wing, Skin Medi Spa, Cambridge Barbers, the Zip Yard and Yum to name but a few. The full list of offers is available here. Please download an application form here. For further information please visit the BT9 Incentives Facebook page at https://www.facebook.com/groups/Bt9incentives. Posted on January 12, 2016 by Miss Thompson. Thanks to your support and the wonderful fundraising efforts of our Friends of Prep, we have fully paid for our new stage! Thank you to all who have generously supported our fundraising events so far both in attending activities and making individual donations towards this venture. The gratitude plaque is now installed pride of place in the Prep Hall. Friends of Prep have committed their future fundraising endeavours this year towards purchasing a new sound system to further enhance our performances so additional contributions will be set towards this project. Posted on November 3, 2015 by Miss Thompson. Thank you to everyone who attended Deane’s at Queen’s on Friday 9th October. It was a wonderful night, and we raised a total of £2,000 for Prep. Congratulations to all of our prizes winners!